In this demo project, I will show you how to create React Axios Tutorial Example from scratch. For this example, I will use Node.js, Express.js, and MongoDB as a backend server, framework, and database. On the frontend, I will use React.js and Bootstrap. In every project, we need to create a REST API at some stage. Axios is a lightweight HTTP client based similar to a Fetch API. Axios is promise-based async/await library for the readable asynchronous code. We can easily integrate with React.js, and it is effortless to use in any frontend framework. If you want to learn more about React.js then check out this React 16 – The Complete Guide (incl. React Router 4 & Redux) Guide. It has a very brief intro about React and Redux. 3 Step 2: Install Bootstrap 4. 4 Step 3: Create React components. 5 Step 4: Create Routing of the components. 6 Step 5: Create a Navigation bar. 7 Step 6: Create a Bootstrap 4 Form. 8 Step 7: Submit The Create.js Form. 9 Step 8: Create backend Node.js server. 10 Step 9: Create a Mongoose schema. 11 Step 10: Create Express Routes. 12 Step 11: Install Axios Library. 13 Step 12: Send Axios GET request. We start this example by installing the React.js using create-react-app. 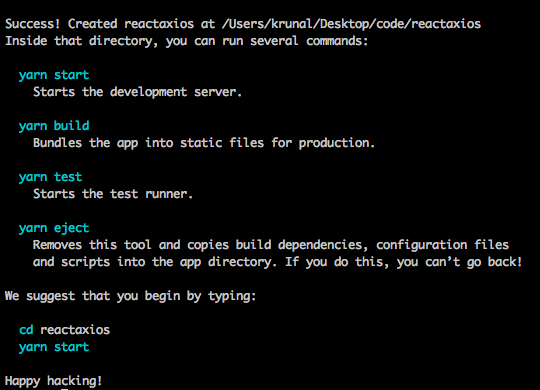 Install create-react-app globally using the following command. You need to enter this command in admin mode. Step 2: Install Bootstrap 4. Install Bootstrap 4 using the following command. Include bootstrap.min.css file inside App.js file. Okay, now we have successfully integrated Bootstrap 4. Step 3: Create React components. Inside the src folder, create a new folder called components. Okay, inside components folder, create two components. Step 4: Create Routing of the components. Install the following routing library. Go to index.js file and Wrap the BrowserRouter object around App.js component. Now, define the routes for each component. Now, go to this URL: http://localhost:3000/create. Step 5: Create a Navigation bar. Okay, now write the following code inside App.js file. Step 6: Create a Bootstrap 4 Form. Add the HTML Form code inside Create.js. Step 7: Submit The Create.js Form. So, now we have two fields. So we need to create two functions that can track both the values and set the state according to it. Also, create the third function that will send the POST request to the node.js server. Now, I need to create an event that tracks the state of both the input types. Finally, when we click the submit button, then data is provided to the server. Step 8: Create backend Node.js server. First, start the mongodb database server using the following command. In the root folder, create one file called server.js. Now, install the following node.js dependencies. Also, we need to install nodemon as a development dependency. Okay, now write the following code inside a server.js file. Now, create a DB.js file inside root folder. Now, import this DB.js file into the server.js file and connect a node.js application to the mongodb database. Now open the terminal, and you can see that our database is connected with our Node Express application. Step 9: Create a Mongoose schema. Step 10: Create Express Routes. Create one folder called routes. Inside that routes folder, create one file called ServerPortRouter.js. Here, I have defined both GET and POST request routes. I have used Mongoose ORM to save the data in MongoDB database. The final step is to import the ServerPortRouter.js file inside the server.js file. The server.js file looks like below. Step 11: Install Axios Library. Okay, we will install Axios via npm using the following command. Now, send the post request along with the form data to the node and express server. First, we need to import the axios library inside Create.js and use that library to send a POST request. Now, enter the values and submit the form. Open your browser console panel and see the response. We can that values are saved in the MongoDB database. Step 12: Send Axios GET request. Write the following code inside Index.js file. Okay, now write the stateless component, and that is TableRow.js component, which we need to create inside components folder. We can see that we have successfully sent an Axios GET request from React.js component. So, in this example, we have seen axios get and post request. Finally, React Axios Tutorial Example is over. Thanks for taking. Clone The Repository. Go into the project folder. Another great tutorial! Thanks so much, Krunal! Pl correct the port no. for the get request in the above code, though it is correct on github.